Non-Stop Low Generation – Great Weather! We have had awesome weather the past several days. Thanksgiving Day was in the upper 60s and sunny. Yesterday was sunny and in the 70s. Today had been in the upper 60s and sunny. Expect to see mid to upper 60s tomorrow and even low 70s Monday and Tuesday. Bring it on! We have had low generation for at least the past five days. We had one spike day, which was Wednesday, there they ran three units for 3-4 hours in the morning then back to the low one unit. That is the projection for Sunday and Monday. This past Wednesday things were back to normal. Jim spent most of the day on the water with Gina. They had a cold start to the day….32 degrees at the start, but it warmed up in temperature and the fish did the same. Better fishing as the day warmed up. Ruby 2 and the holographic green crackleback were their patterns for the day. Ted and his son Jack, took a one-day fly fishing school from Carolyn. They worked on the classroom stuff in the morning at the shop. Later in the morning, when it warmed up a little, they hit the pond and both looked very good by the time we finished up, with their casting. 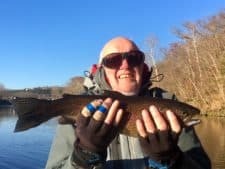 Stan had his regular fishers who have fished with him the day after Thanksgiving Day since 2007, Brandon and his mother Brenda on the water Friday. Good day for them on the lightning bug under the big ruby. Mike and his father, Mark spent half a day with Dana. 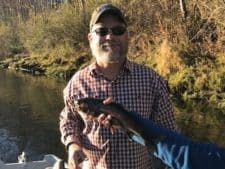 This was Mark’s first experience with a fly rod. They caught a few fish on the beaded red San Juan worm, and a tiger tail. 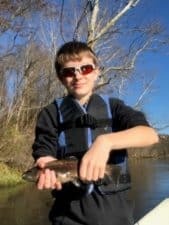 This entry was posted on Saturday, November 25th, 2017 at 5:52 pm	and is filed under Fishing Reports. You can follow any responses to this entry through the RSS 2.0 feed. You can leave a response, or trackback from your own site.